Pick a colour, any colour, then stitch only on projects that contain that colour for the month! Usually I can get my stitching to fit in with the relevant theme albeit with some stretching some months. A round robin counts as a bird, right? 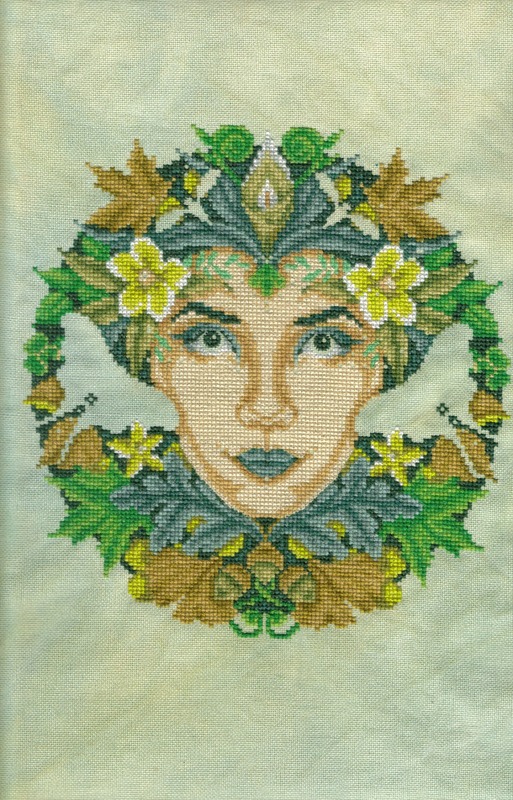 So this month I had the perfect project, Green Goddess by Joan Elliott, lots of lovely green, green and more green in her. Once I restart her I hope to complete her, I'm in two minds about the square border so I may leave it off and keep her as a circle. I've stitched the May JBW alphabet kitty in pink and green but I'm not 100% convinced, I used a nice sugar pink fabric because I wanted to use different colours for each month but I think it would look more blossom like if I used pink thread on green fabric. If I have time at the end of the month I might do the other colour way and see which I prefer! No picture as yet. I changed the first heart as it was a plain solid heart designed to show off your chosen variegated thread but I charted our four initials to fill the heart shape. It's so much fun getting a new chart each Sunday morning and having all day to stitch. The Small Boy's current craze is video clips on Youtube so I can sit next to him, stitching away and be ready to click on his chosen one. The Barefoot Books songs are my favourites. I have reached another milestone - 400 Followers! That calls for a little giveaway. I spent today sorting out the parcels for my last two giveaways which should be mailed this weekend. Then I can see what's left I mean choose something special! And devise a cunning competition. Talking of something special, I received my prize for the best wood themed puns on Shebafudge's blogaversary giveaway. Sharon was celebrating five whole years of blogging which is Wood in anniversaries so I left an extremely hilarious comment on her blog using every bad joke I could think of. Evidently Sharon appreciates bad jokes (I wonder if her husband tells Dad Jokes!) and said she would send me something wood-themed. The parcel duly arrived and when I opened it I found a lovely piece of fabric. Oh well, I thought, she couldn't find anything wooden. Then I saw the name - Sun Dappled Glade! How perfect is that? I even have a chart that will look rather nice on it. Fifth one down on the right hand side, a Passione Ricamo freebie fairy designed to celebrate Fairy Day 2007. Finally the Shepherd's Bush Buttercups chart I was looking for has arrived, along with four little friends courtesy of Laura aka Ilkinbillburg of For the Love of my Needle blog. She said she had all five in her stash for many years and will never stitch them herself. I have generously offered to lend them to her if she changes her mind! A Big Thank You to Laura and all the other people who also offered to send the charts to me. Stitching Bloggers really are the best people! I have spent my £10 voucher from Willow Fabrics on the required linen and will make a start immediately after my Round Robin mermaid. Yay congratulations on 400 followers. Shows how entertaining you are! Yes my friend you need another SAL as much as I need a New start LOL! Go for it though. I think the pink thread on green fabric will make it pop. I tend to use contrasting thread to fabric as much as poss as I like the art to contrast with the background and stand out. Will look very coool! You got alot going on as usual Jo it all sounds great and will keep you out of trouble for a while. Green Goddess looks great Jo. What beautiful colors. Green is my favorite color. Congrats on your wins. Congrats on 400 followers! That's amazing! 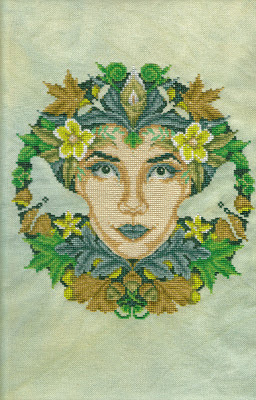 Love all your stitching, but the Green Goddess is really neat! Beautiful colours on the Green Goddess and on the little hearts. Congratulations on reaching 400 followers. GG is stunning, I think I might leave her rounded. Congrats on you fabric win sounds an interesting colour. congrats on hitting the 400 followers mark, thats amazing! Goddess looks amazing too. Gotta share the Barefoot Books songs with my kids - they'll love them! Congratulations on reaching 400 followers. Your Green Goddess and your hearts are lovely. Looking forward to watching your progress on your fairy. Your Goddess is looking amazing!!! Congratulations on 400 followers!! Green Goddess is looking wonderful. Love the thread you used on the hearts. I like the hearts. Nice way to show off what a variegated thread can do. Glad you liked the fabric. I love the fairy you have chosen. Yes Colin does tell very bad jokes. You should hear him at the table sometimes - I'm surprised no one has choked yet. Sadly Rachael and Luke are going the same way despite my more mature influence.